Keep out flying pests and enjoy fresh air this summer. Buy highest quality European Chain Link Screens online at NewBlinds.co.uk at the UKs best prices. We have both standard sized door screens (900mm w x 2100mm h) and custom sized screens available to order. Our chain is top quality European anodised chain - It stays strong, clean, shiny and doesn`t rust, go brittle or fade. You'll use our screens for years to come, unlike cheap imported immitations. Buy online by selecting a product below! - Silver, blue, bronze-brown and green chain available. - Unique pattern designs available. - Rust proof and colour fast - will not tarnish. Why buy Our Chain Fly Screens? Top Quality European Chain - Insist on Quality! Over a number of years, we have noticed a cheap imitation chain link screen imported from the far east being sold cheaply within the UK. We have been asked why our chain is more expensive than this cheap imitation. The reason is simple... Ours is better quality and will last longer! - Years of Experience: The European manufacturers of our chain have been in business for many years making this high quality chain. - Anodisation: They have perfected a process known as anodisation. - Strong: The process of anodisation strengthens our chain and protects it from bending out of shape or become brittle. - Clean and Shiny: Anodisation repels dirt and grime meaning that our chain stays looking clean, bright and shiny. - Colour Fast: Anodisation protects chain that has been coloured ensuring that it retains its colour for many years. 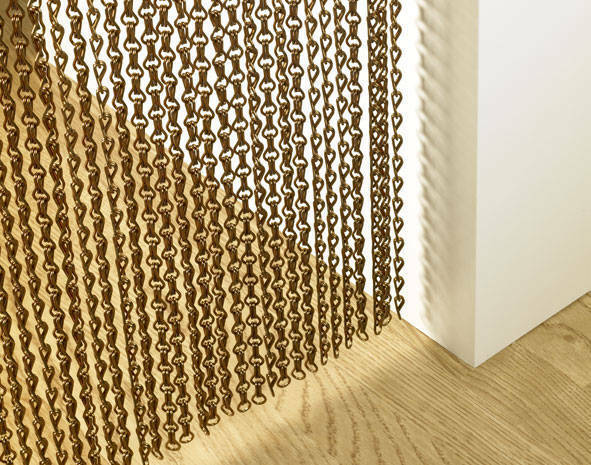 - Evenly Spaced: Our European manufacturer has perfected the process of making uniformly spaced chain, so our chain looks evenly spaced and tidy. We have known about this immitation low quality chain link screen for a number of years and could have tried to sell it on our website. However, we have chosen not to because we prefer satisfied customers, who will recommend our chain link flyscreens to their family and friends. As well as offering standard sized kits for doors, which are 900mm wide x 2100mm high, we are also able to offer custom sized screens. Simply enter your sizes and select whether you wish to assemble your self (self assembly), or if you wish us to do that for you in our factory (ready made). We offer next day delivery on all of our standard sized door kits, subject to stock. Custom sized screens take a little longer due to the time involved. Our chain insect screens are commonly used in food preparation areas and are also ideal for home and business use. Convinced Yet? 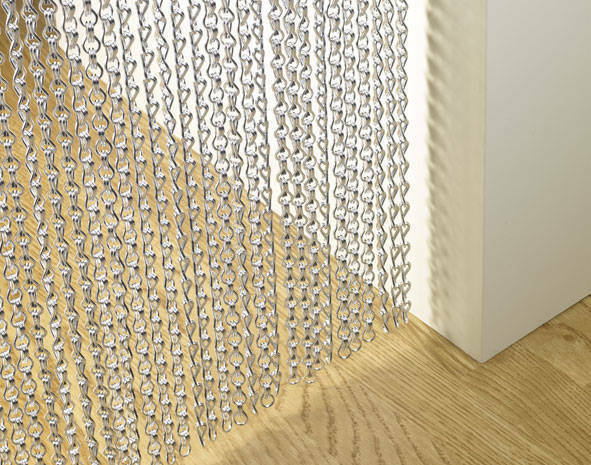 Take a look at our standard sized door chain screens and custom sized chain screens and buy online with fast UK delivery!